From now on, a tree at Charles Street Park in Highspire will remind the family of Betty Dengler of her dedication to the borough. 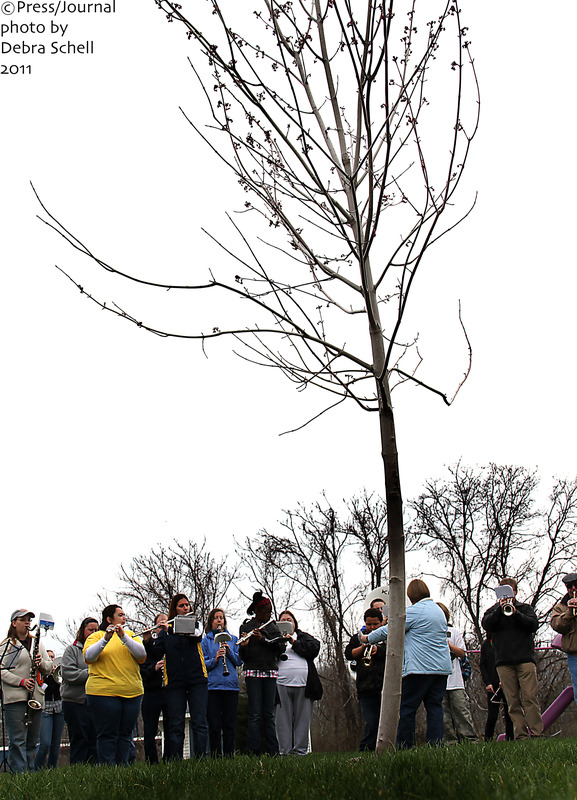 A Red Sunset Maple was planted in her memory and presented to the community on Sunday, April 10, during the borough’s annual Arbor Day Ceremony. Dengler, who died last year, often visited the small park with her grandchildren where she would sit and watch them play, said daughter Rose Tonkin. Dengler was a lifelong Highspire resident, a member of the Highspire Historical Society, and volunteered to work at the Wilson House on Second Street. “She would always say that it was too hot, and said that the one tree in the park was too far to watch the children,” said Tonkin. “This is a perfect spot for the tree,” she said, looking at the maple already starting to bloom. The ceremony also highlighted the 19th year Highspire was awarded with the Tree City USA Award. Andrew Brought, forester with the Pennsylvania Department of Conservation and Natural Resources, presented a flag to Highspire Environmental Advisory Board members, Highspire Mayor John Hoerner, and Borough Council President, Kay Sutch, during the ceremony. The flag will be placed on the pole at the borough building.